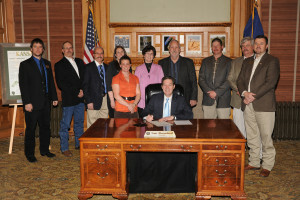 Governor Sam Brownback signed a proclamation on Friday, April 19th, declaring April to be Auctioneer’s Month. Of course, this was after he asked Megan McCurdy to auction off one of his ceremonial pens as he likes to hear an auctioneer’s chant. Meeting with him, from left to right was Aaron Traffas; Tom Lindsay, Jr.; Rick Brock, Megan McCurdy; Hope Edelman, Auxiliary; Cindi Ferguson; Richard Garvin; Kevin Ediger; Jeff Ruckert; Bill Eberhardt. After the meeting with the governor, the KAA Board of Directors conducted their April meeting.